I love this time of year and everything about it. 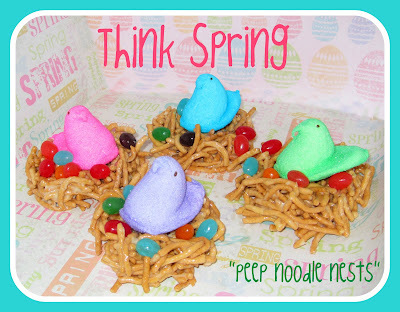 Here's a little tasty treat that takes me back to my childhood as every time around Easter we'd stock up on the "peeps" and make these fun little treats. They're super easy and tasty so it's a great activity to do with the little ones. Enjoy! Grease cookie sheet. Melt butter and marshmallow in microwave for 1 min. (cooking time varies). Stir until a smooth consistency. Add chow mein noodles and stir until evenly coated. Shape into nest and place on cookie sheet. Add the jelly beans and the peeps and you're done. Easy as can be! Tip: If you don't like chow mein noodles, we have also done these with rice krispy treats and they turned out really cute as well. Are cute are these. I love the idea. I see a FHE treat in our future - or maybe a between session treat this weekend - Love it!